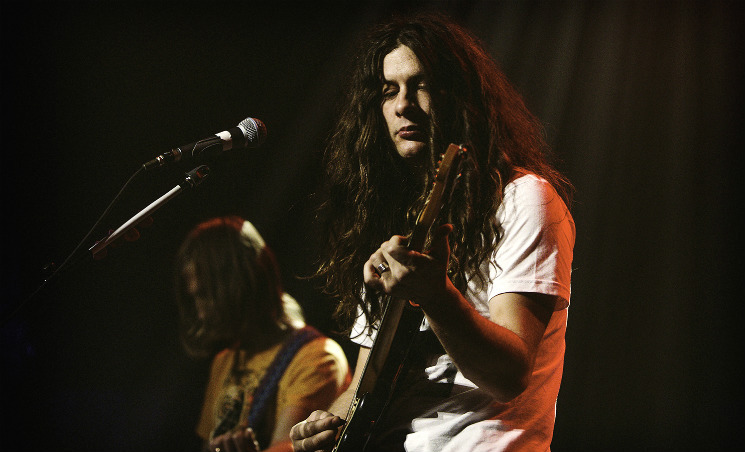 Shrouded in long hair and weirdo boyish charm, the widely beloved and critically acclaimed Kurt Vile seemingly possesses the power of hypnotism; his understated confidence and undeniable skill draws crowds in with a magnetic pull. Touring in support of his latest LP b'lieve I'm goin down…, Vile took to the Corona Theatre stage yesterday evening (February 20) in front of a sold-out crowd, his backing band the Violators in tow. Opening for Vile were Xylouris White, a duo composed of lauded Cretan lute player George Xylouris and Australian post-punk drummer Jim White. Joined by an upright bass player for the entirety of their set, the group proceeded to throw the audience into a state of mild — and fascinated — confusion. With no single geographical location grounding their music, the group infused their set with everything from klezmer to folk to punk and bluegrass, each track carrying a distinct flavour of its own. Surprisingly nuanced and masterfully played, Xylouris White's music managed to warm up the crowd just enough, with everyone turning to their friends afterwards to discuss what they'd just seen. Showered in blue light, Kurt Vile and co. took to the stage shortly afterwards with a quick "Hey," and launched immediately into "Dust Bunnies" off b'lieve I'm goin down. Switching to the banjo for the second song "I'm an Outlaw," and then to another guitar for "Pretty Pimpin'," it was clear that the night would feature a variety of instruments on constant rotation. Empty spaces between songs normally reserved for witty stage banter were instead filled with guitar changes, quick tuning and the occasional "Thank you." While the transitions were sometimes choppy, the crowd fell silent, again and again, whenever Vile launched back into a new song, his twangy, milk'n'honey vocals sedating the crowd. While Vile began his set with a handful of new tracks, the latter half was defined by everything that came before. Performing "KV Crimes" and "Wakin' on a Pretty Daze" off his previous LP of the same name, followed by "Jesus Fever" (Smoke Ring for My Halo) and a heavy solo performance of "Dead Alive" and "Hunchback" (Childish Prodigy), it became clear that much of Vile's allure could be attributed to his consistency throughout the years. The audience revelled in his trademark poetic nonchalance, everyone fixed in place, staring straight ahead, save for a few who were swaying back and forth, singing along with a smile. Finishing the main act with a stellar sax solo by bandmate Jesse Trbovich during "Freak Train," Vile saluted the crowd before coming back on stage for the encore, holding the bottle of red wine that he had been nursing throughout the evening. Closing the night with "Peeping Tomboy," "Baby's Arms" and a wild, resonating cover of Bruce Springsteen's "Downbound Train," Vile mumbled that he'd be hanging out by the merch table afterwards, encouraging people to come by and say hello.